"This simple turkey gravy is...wait for it...simple! You don't want to use gravy from a can or from a package when it's this easy and delicious!" Heat fat from turkey drippings in a saucepan over medium-low heat until liquefied, 2 to 3 minutes. Whisk flour into turkey fat until golden, about 5 minutes. Whisk liquid from turkey drippings and turkey stock into fat-flour mixture; increase heat to medium and cook, whisking continuously, until gravy is smooth and desired consistency, 5 to 10 minutes. Season gravy with pepper. 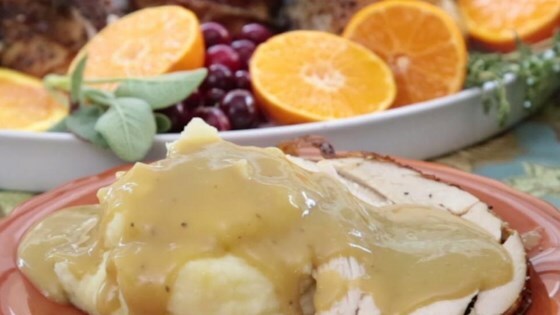 See how to make the perfect turkey gravy. Chicken stock can be substituted for turkey stock. Yes, it was a simple to make recipe. The family loved it. Easiest gravy recipe I've found!! Great last minute gravy, taste good??! I’m not a big gravy fan but this is so easy and everyone seems to like it!